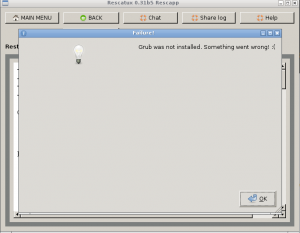 This wizard explains step by step how to restore Grub to your machine thanks to the graphical click-and-fix rescue suite Rescatux. 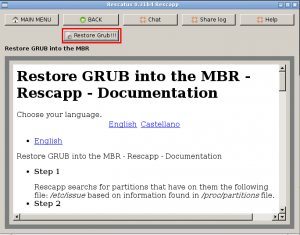 You can find more information about what problems you can solve with this wizard and what you get after performing the Wizard steps at: Wizard – Restore Grub . 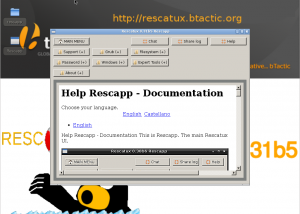 This wizard step will help you to identify when to press return at Rescatux boot. 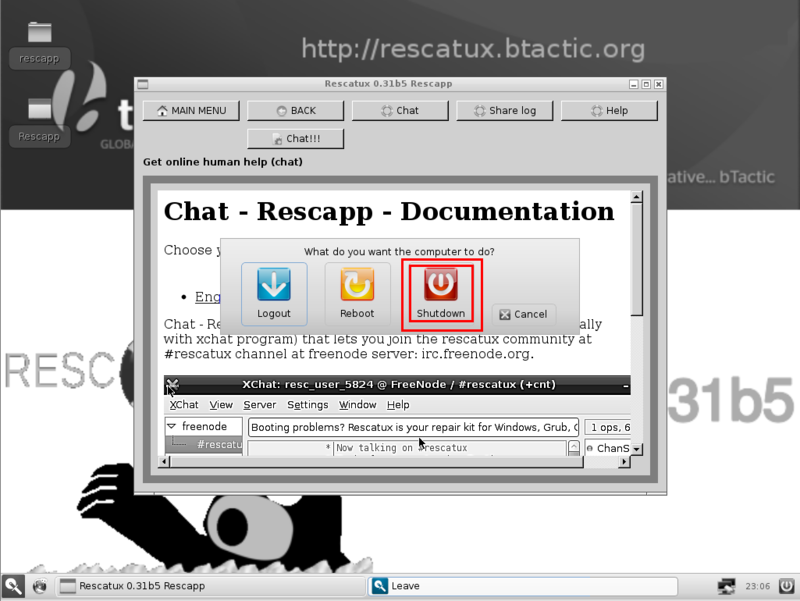 When you boot in Rescatux the Rescatux autodetect option is selected by default. Just press return. If you don’t press return it will be autoselected in 60 seconds time. 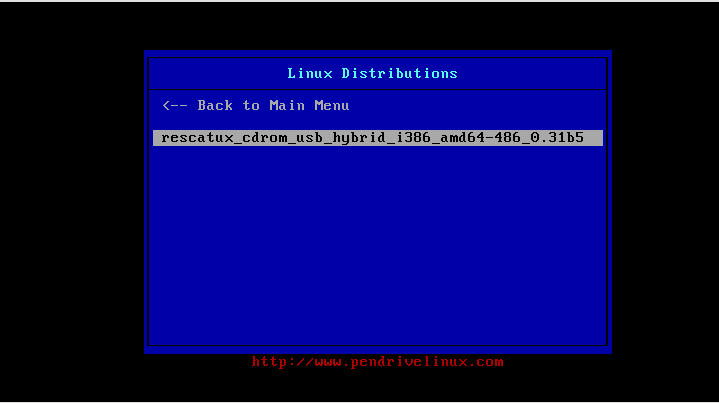 You have to select Linux Distributions by using down arrow key and then return key. 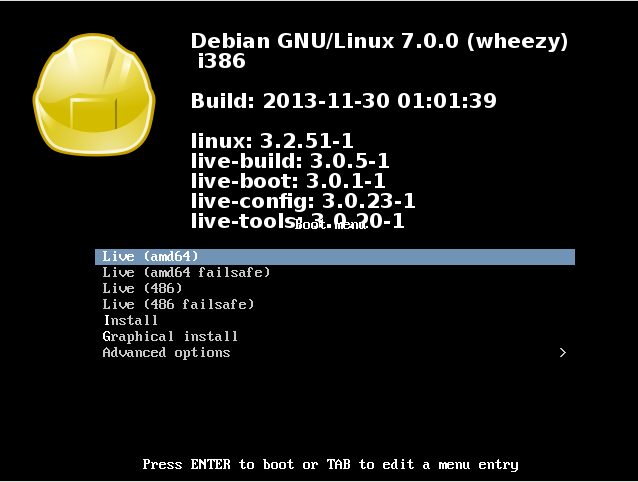 Then you get into Linux Distribution screens. 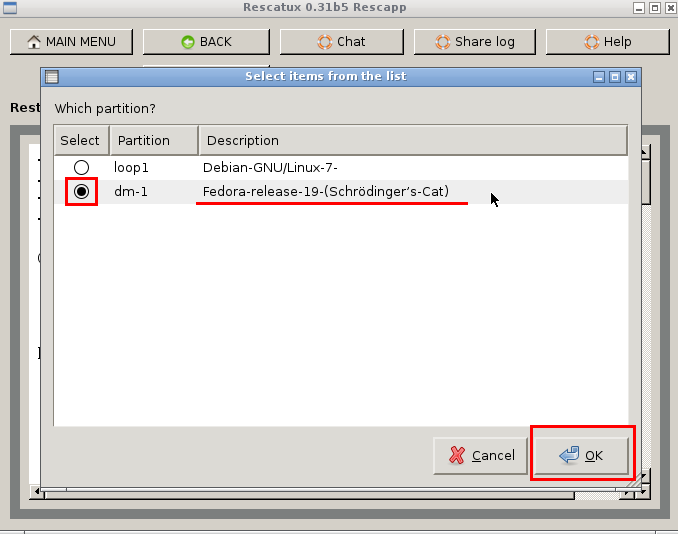 Use again the down arrow key and then return key to select Rescatux entry. 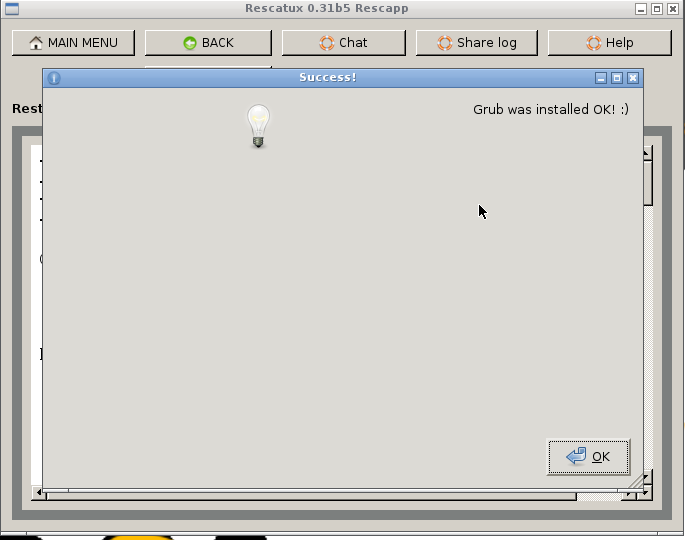 Finally you get into Rescatux ISOlinux screen. This kernel requires an x86-64 CPU, but only detected an i686 CPU. 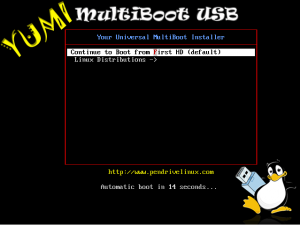 Unable to boot - please use a kernel appropiate for your CPU. then repeat all the steps in order to boot into your device but in this screen select: Live (486) entry instead. Once you have selected your entry you have finished this wizard step. 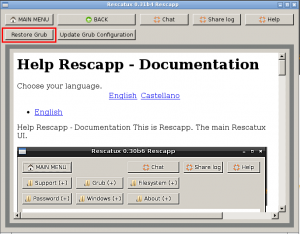 This wizard step will help you to know when to stop waiting for Rescapp to being open. 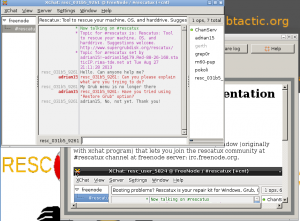 After several letters appear in the screen a graphical interface appears. 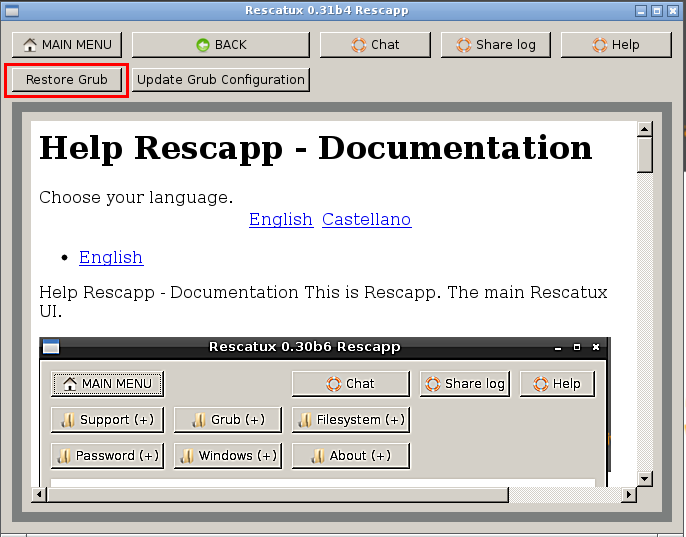 Wait for Rescapp application to be opened in the center of the screen. Once you see Rescapp you have finished this wizard step. 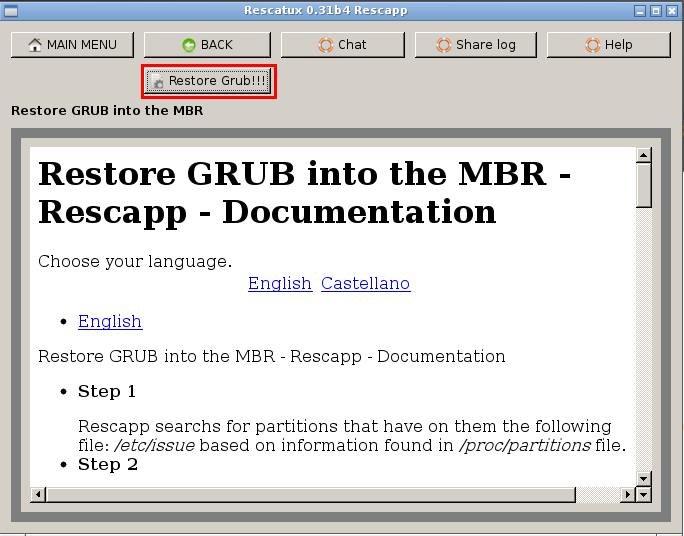 and finally on Restore Grub !!! button. 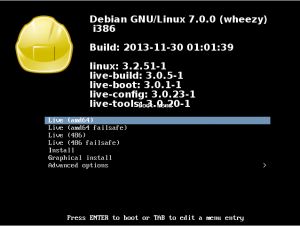 You will be asked which is your Gnu/Linux partition. 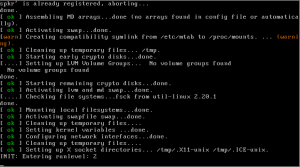 You should select your Gnu/Linux distribution partition. You should ignore loop1 partition which it is the Rescatux device most of the times. 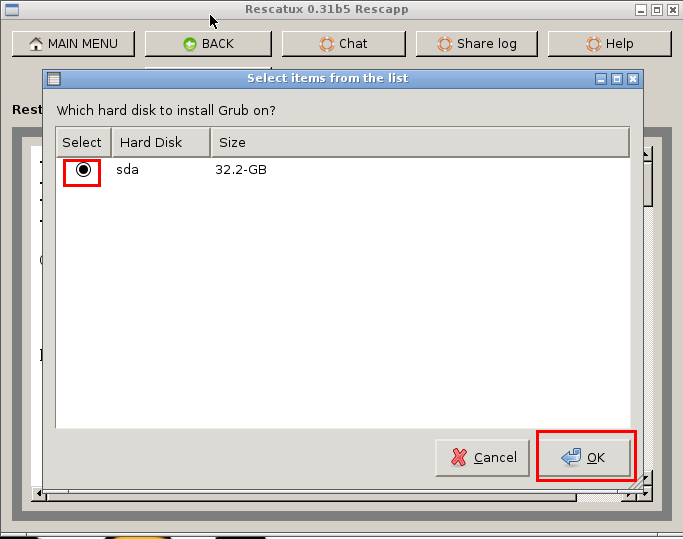 You will be asked which hard disk to install Grub on. 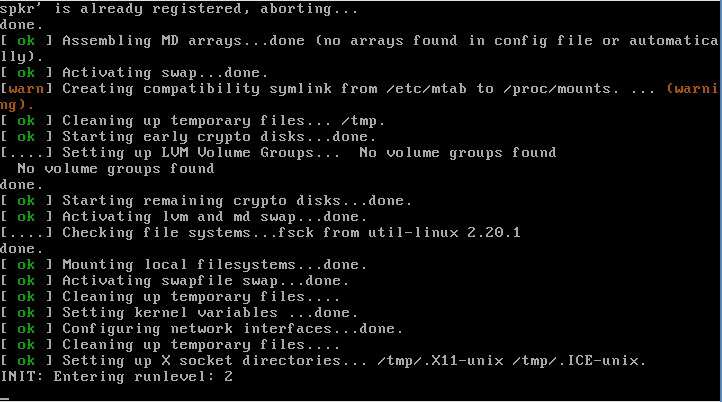 Usually you should select the same disk where your Gnu/Linux partition is because usually you only have a hard disk. 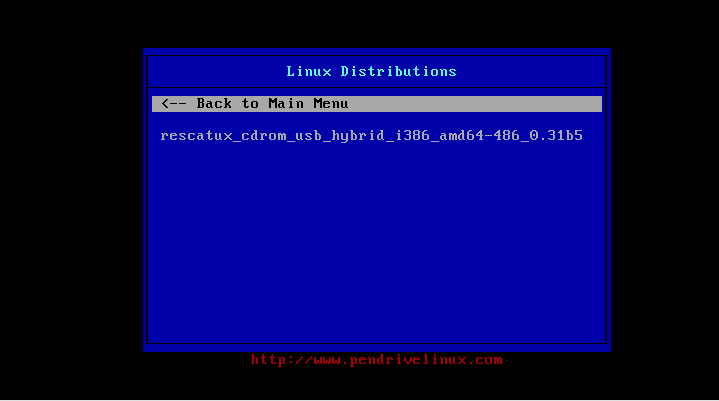 In some cases you need to select the first hard disk that boots when the computer boots. Only when you have more than one hard disk you will be asked to order your hard disk in the same boot order as the BIOS boot order. 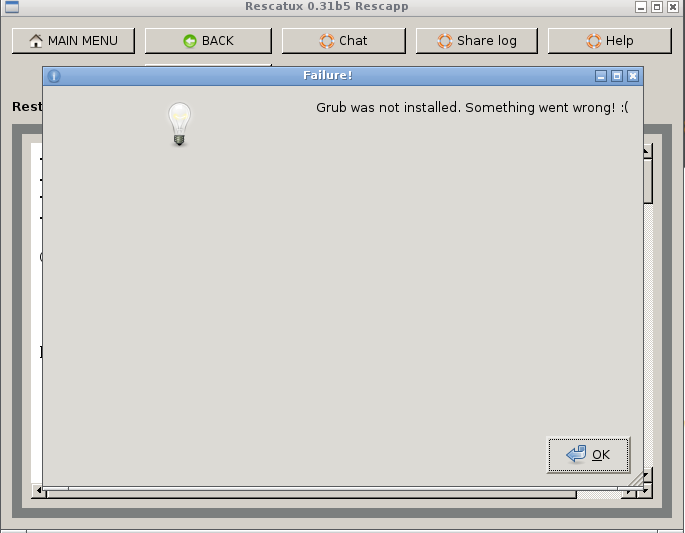 That ensures that Grub knows if it’s booting from the first device to boot or from a secondary one. Sometimes a message is shown while Rescapp is performing the asked task. Sometimes you won’t see it because it won’t last too long. Please be patient and wait till it finishes. 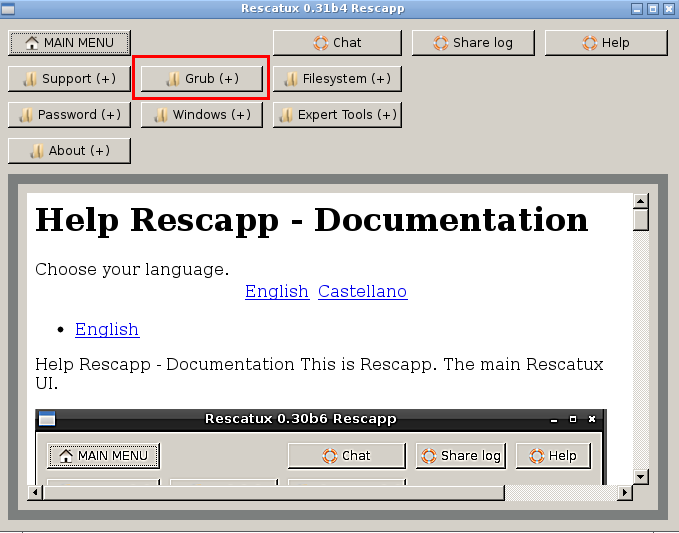 If you are seeing a message that your task went OK then Rescapp has probably fixed your problem. 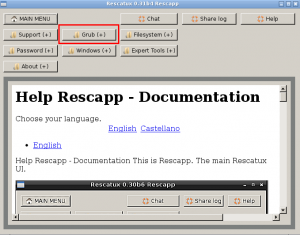 If you are seeing a message that your task went wrong you are invited to click on Chat button at the right top corner of Rescapp to ask for help. You will be probably asked to share your logs thanks to the Share log button. Don’t be rude when asking your questions, try to be patient, that means that wait for 10 minutes for someone to reply. If no one replies understand that donations do not afford in order to pay someone 24 hours a day to answer everyone questions. You still have the chance to ask via the forum, mailing list, or even trying to check in the chat if someone is finally online and available while you use another operating system or a friend’s computer. At the right bottom corner of your screen you will find an on/off button. Click on it. Finally select Shutdown on the menu. After a bunch of letters your computer will be powered off. 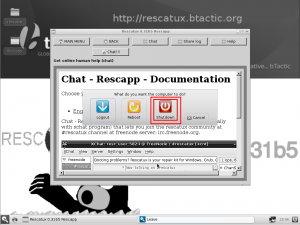 If you want to use your computer as everyday you are advised to remove the Rescatux media so that Rescatux does not boot instead of your regular Operating System. Please ask for support on the mailing list. I used recatux to repair the ubuntu boot but now i am unable to boot in my windows10. Also after fresh install of windows the problem still persists.. Can Anyone help me out. 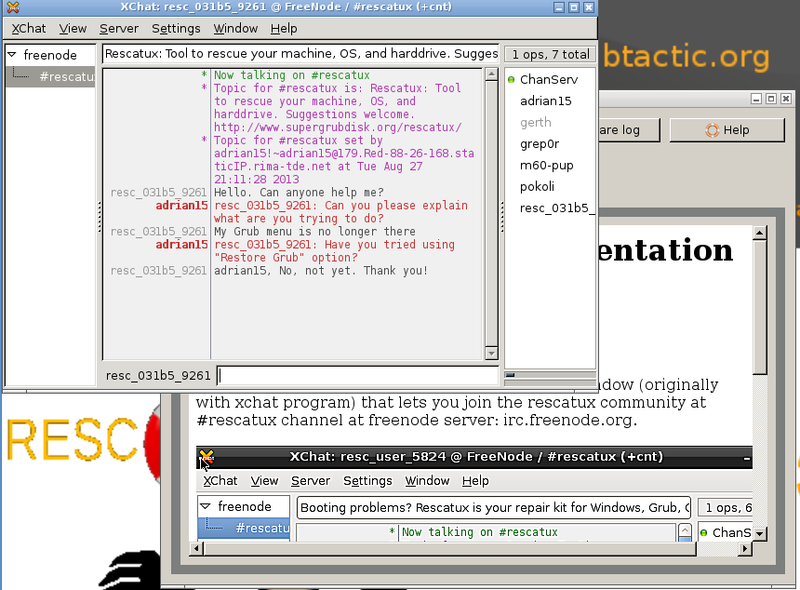 Akash: Please use the mailing list for support.